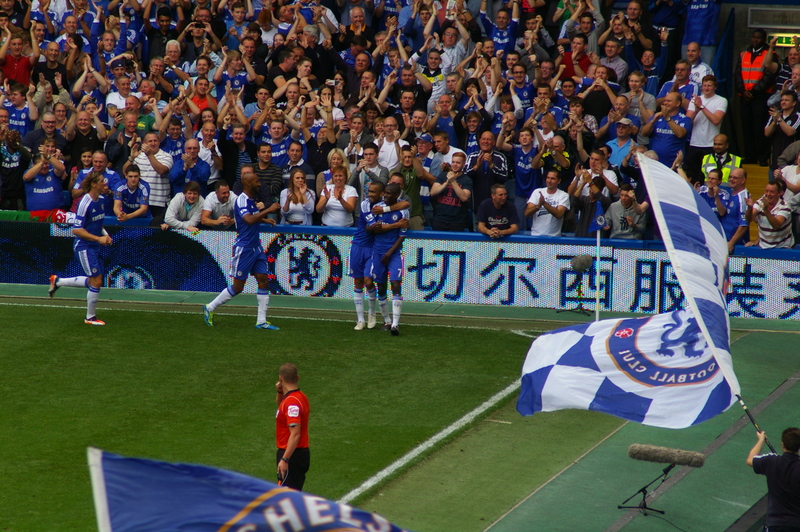 Chelsea vs. Swansea City : 24 September 2011. This was another home win and a further step in the redevelopment of the new Chelsea. It was a lovely day out in London Town, with friends old and new. A great Chelsea Saturday, in fact. I had a later start than usual, picking up Glenn in Frome at 9.30am and Lord Parky in Holt at 10am. Knowing that our pre-match would be squeezed, we had a McBreakfast on the hoof and I made good time as I headed east. I passed a few Swansea City cars on the way. This would be my first ever sighting of Swansea at a Chelsea game. Our two paths haven’t crossed in any competition since that memorable 1983-1984 season, that most beloved of seasons from our past. As I have mentioned before, for some reason, season 1981-1982 has been in my thoughts recently. I always remember our opening game in that season was a 2-0 win against Bolton, but the biggest news story on that day was newly-promoted Swansea’s 5-1 annihilation of Leeds United. I can still picture the mixed emotions of the two sets of fans on that blisteringly hot day at the Vetch Field. Swansea’s big win definitely got a loud cheer in The Shed that afternoon. I became good friends with a Leeds fan at college, who had travelled down to South Wales on that day and he told me that it was one of his worst ever days as a Leeds fan. Leeds took thousands down and I can still see the silent and shocked reactions of the Yorkshire hordes every time Swansea scored. Swansea, in fact, finished in second place in the old first division in 1981-1982 – an amazing achievement – but were then relegated in 1982-1983. We met in 1983-1984, but our paths then took very different directions. I actually saw Swansea at Yeovil in 2005 – a Yeovil team which included JT’s brother Paul – and for the best part of the past thirty years, they have been mired in the bottom two divisions. Credit to them for clawing their way back to the top flight. Glenn and Parky darted off inside The Goose, but I had other plans. I raced down the North End Road as I had friends to meet down at the hotel. The weather was surprisingly warm and I quickly peeled off my zip-up top. Underneath, I was wearing a bright “Clockwork Orange” T-shirt (picked up in Bangkok for about £5) and I soon realised that Swansea’s away colours were also orange. Oh well. I wasn’t worried. As I wasn’t sporting a moustache, I knew I wouldn’t be mistaken as a Welshman. Another Chelsea game, another CIA visit. This time, it was Damian (Trojan Man) and his lady Laura. I dipped into “The Butcher’s Hook” to collect them and took them over to the hotel, where I knew other friends would be waiting. We had a lovely pre-match, albeit a rather short one. I met up with Mick, who had managed to get me a few of my Asia tour programmes signed by Terry, Lampard, Drogba and Torres. The original idea was to sell these on Ebay, but I soon decided to give these away to a few close friends. Gill, Graeme and Ferdi were in the hotel bar (Gill had managed to get a photo with JT an hour earlier) and Mike from NYC was there too. Two pints of Singha – thanks Mike, thanks Damian – and a nice time chatting about the entire gamut of Anglo-American sport culture with my two Southern Californian guests. As his CIA handle would suggest, Damian (and Laura) are fans of the USC gridiron team and we spent quite a while chatting about NCAA fandom, rivalries, ticket prices, match day routines and rituals. Mike had brought me a recent copy of the NY Post which featured a few articles about Mariano Rivera’s historic 602 save. Damian, with a pained expression, enquired why I was a Yankee follower and I’m getting used to this now. I batted the question away with aplomb, like a cricketer driving a ball through the covers. I always used to say I wish I had £5 for every time someone asked me why I was a Chelsea fan. It’s getting that way with the Yankees now. Damian’s face was a picture. I felt Damian’s relief sweep over him. For a Chelsea fan, it must have hurt to see us train on UCLA’s campus during the summer tours of 2006 and 2007. That must have been awful for him. We were stood by the window at the front of the hotel bar area on the first floor. We had a lovely view of the forecourt area, with the busy Fulham Road in the distance, the “Butcher’s Hook” pub on the corner. We spotted six Chelsea pensioners being dropped off and making their way through the match-day crowds. They are always a lovely sight. They continue to be a wonderful reminder of our history, our proud past and long may they continue to be a part of our identity as a club. Damian asked me briefly about our continued presence at Stamford Bridge and if I favoured a move away. To be blunt, I want us to stay at Stamford Bridge forever. Just looking out at that forecourt area was enough for me. Photographs of thousands flooding that area for the Moscow Dinamo game in 1945, grainy film of the team playing five-a-side amongst the portacabins and parked cars every Friday morning in the late ‘sixties, personal memories of me looking up at the monstrous East stand for the very first time in October 1974 (this still gives me goose bumps), scary memories of Millwall in 1977, memories of West Ham in 1984, gorgeous memories of getting Pat Nevin’s autograph outside the old club shop in 1984, my mate Glenn chatting up a girl in the programme hut in 1983, memories of the ivy on the wall of the old offices, memories of getting Ray Wilkins’ autograph in 1978…memories, memories, memories. What I fear is my club playing in a soul-less stadium five miles away in 2025…what will we have lost? At 2.20pm, I reminded Laura and Damian that the players would soon be going through their pre-match drills and so I quickly escorted them out of the hotel and towards the entrance to the Shed Lower. To our right, we saw a cluster of fans around a bald gentleman and I soon realised that it was Ray Wilkins. I told the two Californians to “get in there” and I grabbed Laura’s camera. While Damian quickly spoke to him, I said “thanks Butch” and I had this horrible feeling that he might have thought that I was taking the Mick. I said my goodbyes to the Trojanistas and made my way to the MHU turnstiles. It made a nice change to be inside early for once. I was at my seat at 2.30pm and Stamford Bridge was looking gorgeous. Pre-match chat focussed on how well we played at Old Trafford. The 3,000 Swansea fans were in good voice and treated us to the Welsh standard “Hymns And Arias” (aka “Land Of My Fathers”). The Swansea team featured two players born within 12 miles of my home town; Scott Sinclair from Bath and Nathan Dwyer from Trowbridge. Parky’s mate Kris used to play footy with Dyer in a Trowbridge park and, even at a young age, he was special. My home area is not known for producing professional footballers. Whatever happened to Shagger Lambert from Farrington Gurney, Nasher Ruddock from Midsomer Norton and Crapper Lacey from Buckland Dinham? The football world is a lesser place with their absence. No real surprises with AVB’s team selection, with Anelka in for Daniel Sturridge. Ominously, Frank Lampard was on the bench, but this was not a surprise. He faces new challenges this season. The game began quietly, with the highlight being a lovely dribble along the by-line by Juan Mata and a ball back for Ramires to fire goal wards, but the shot was blocked. The opening period also featured two horrendous crosses from the not-so-trusty right foot of Jose Bosingwa. Swansea had a few attacks, but were not causing us huge concerns. I was getting a little annoyed with Torres coming deep to search for the ball. I wanted him to stay on the shoulder of the last man. On 29 minutes – just after I had said “Come on Torres, move!” – Juan Mata chipped a fantastic ball over the Swansea defence and the ball fell right at the feet of Torres, who had nimbly lost his marker. A deft touch and the ball nestled inside the far post. I took some photos as the team joined Nando down in celebration corner, and I hoped that Laura had some good shots, too. This was the quintessential New Chelsea Goal; Mata the creator, Torres the finisher. May there be many more. Shortly after, a lovely searching ball found Ramires who advanced and despatched a low strike through the legs of the Swansea ‘keeper and it was 2-0 to Chelsea. More photographs of the team, smiling away down in the SW corner. Then, a crazy calamity. We all knew that Torres’ ridiculous challenge warranted a red card. That was obvious. Slightly less obvious was why Nando needed to make that challenge. It wasn’t in a threatening position. I guess – I’m just rationalising – after Old Trafford’s highs and lows, after his goal, after his nice contribution to Ramires’ goal, his head was buzzing. But he needs to learn from this. I’ve noticed before how he makes rash challenges. My comment after the Manchester United game (“what next in the chequered Chelsea career of Fernando Torres?”) came into my mind as we discussed the tackle in the last few minutes before the break. The poor chap seems fated. At the break, Neil Barnett spoke about the sad incident recently which resulted in the deaths of four Swansea miners and passed on our deepest sympathy to the Swansea fans. This was a nice touch and both sets of fans applauded. Additionally, Neil mentioned that there had been collections throughout the day and Chelsea would match the funds raised and give all the money to the families of the bereaved. The Swansea fans applauded this. Anelka was deployed as a sole attacker ahead of the infamous “two banks of four.” However, Swansea sensed the initiative and Dyer let rip with a shot which was deflected off the outstretched leg of Mikel and dipped wildly onto the bar. A Swansea effort was then hacked away off our line. These were tense moments. Florent Malouda replaced the bubbly Mata on the hour. Fresh legs for the team. For the second game in four days, ten men were being asked to do the work of eleven. Anelka found himself surrounded by four defenders, but with no support to be found anywhere. In a classic piece of football, he shrugged his shoulders, went on a run and clipped a heavenly strike against the bar. What a goal that would (could? Should?) have been. Down below me, Ashley Cole stretched and blocked an attempted clearance by Routledge, then narrowly shot past the far post. He was roundly applauded. On 75 minutes, I disappeared off for a toilet break and returned just in time to see a ball played into Ramires’ path, a shimmy and a cool finish. That was really unexpected – we had been playing a containment game really, but this goal killed the game…time to celebrate? Not really. The Bridge crowd cheered the goal, but there was no continued barrage of noise. Didier on for a great Anelka, Josh on for Meireles. We then let in a “typical Chelsea” goal from a wide free-kick. An unmarked leap at the far post and we all knew what was coming…the ball crashed down and into the corner of Cech’s goal. We had two late chances…a Malouda shot blocked and then, with Ramires on a deserved hat-trick, he unfortunately drilled his shot wide. At the death, a sweet turn and a deft finish from Didier. I left the Barons Court area at 5.45pm and we listened to “606” on the drive home. Mark Chapman, who I neither like nor dislike, tried his damnedest to get Chelsea fans to ‘phone in and comment on the Torres sending-off (not his goal, I hasten to add), but I was very contented when nobody could be bothered to do so. Good. Let’s concentrate on the positive (two goals in 135 minutes) and not get sucked into this Torres bashing session. As I came off the M4 at Chippenham, all three of us “whooped” at the news of good old Stoke’s draw at home to United, who – in my book- are the team to beat. This entry was posted in Season 2011-2012. and tagged 2011-2012, Chelsea In America, Fernando Torres, Stamford Bridge by Chris Axon. Bookmark the permalink.